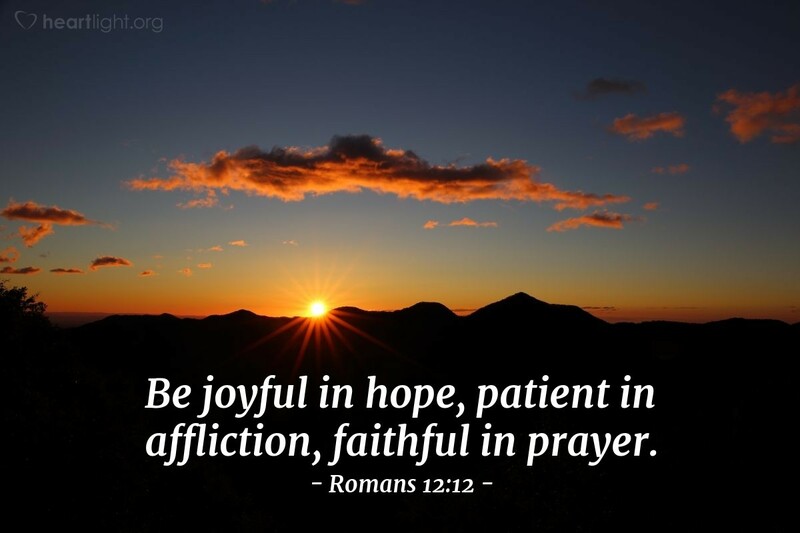 Joyful, Patient and Faithful? That's a tall order. And at the same time? Nobody wants pain to last a long time. There isn’t a person I know who prays for more challenges! Since patience is built from the trying of your faith, if you are praying for more patience, you may just get more trials! Patience and Perseverance are interchangeable in scripture…perhaps because sometimes you feel like you are at the end of your rope and you just need to tie a knot and hold on. Hold on till hope rises in you. Jesus said in this world you would have tribulation…but he didn’t leave us hanging…he said be of good cheer(rejoice)….why? Because HE has overcome the world! Not just the trouble, Jesus said I’ve overcome the world in which trouble shows up! So how do I hold on? Stay in touch. Your power and guidance will come from a life filled with prayer. We need to move out of this mode of just a prayer time to a life that is constantly laced with conversations with God. Talk to him throughout the day. Be engaged! Pretty great advice for how to get along in this life. Joyful, patient and faithful!